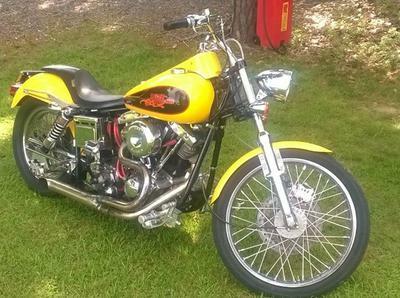 The 1973 Harley Super Glide has lots of custom motorcycle parts, too many to list here, actually but here are a few of the features of this fine old Harley. Standard heads, an Arlen Ness swing arm, struts, progressive shocks, light isAN La Pera seat. This vintage motorcycle has an all-polished billet motor, transmission, etc. Go here to see more and then come back to this stunning ride! The old Harley has just 1600 miles on the engine since the build. She has been my sweetheart since back in 95 and the only thing she needs is a new ratchet top. The 1973 Harley Super Glide with Lots of Custom Motorcycle Parts is in Biscoe, NC North Carolina. Take a look at others and if you like mine the best (which I believe that you will) email me using the comments form provided by GoGoCycles Used Motorcycles for Sale.